Recently, we hosted a workshop on Algorithms and Optimization in our office in Zürich, with the goal of fostering collaboration between researchers from academia and Google by providing a forum to exchange ideas in machine learning theory and large-scale graph mining. As part of the topics discussed, we additionally highlighted our aim to build a group similar to the NYC algorithms research team in Google’s Zürich office. Market Algorithms: This session included five talks upon problems related to optimizing online marketplaces and repeated auctions. Vahab Mirrokni (Google New York) opened the session with an overview talk about market algorithms project, then Paul Duetting (London School of Economics) presented recent advancement in stochastic optimization for pricing. Renato Paes Leme (Google New York) spoke about dynamic auctions in practice. Stefano Leonardi (Sapienza University of Rome) presented the challenges arising from the Reservation Exchange Markets and finally Radu Jurca (Google Zürich) explained how to pack YouTube Reservation Ads. Machine Learning Theory: Our second session focused on theoretical aspects of machine learning research. Olivier Bousquet (Google Brain Team, Zürich) opened the session discussing challenges in agnostic learning of distribution. Then Amin Karbasi (Yale) and Andreas Krause (ETH Zürich) presented recent results on submodular optimization and learning submodular models. Martin Jaggi (EPFL) explained new technique to parallelize optimization algorithms. And finally Nicolò Cesa-Bianchi (Università degli Studi di Milano) presented new results on bandits. Large-scale Graph Mining: In this session, we presented some of our achievements and challenges in the context of large-scale graph mining project. Silvio Lattanzi (Google Zürich) opened the session describing the applied and theoretical work of the Graph Mining team. Then Piotr Sankowski (University of Warsaw) presented an interesting model to explain the size of cascades in real-world graphs. Thomas Sauerwald (University of Cambridge) presented some new results on Coalescing Random Walks and Peter Sanders (Karlsruhe Institute of Technology) presented several interesting results in algorithm engineering for large datasets. After this talk, we brainstormed with Peter Sanders and Christian Schulz (University of Vienna) on different techniques to produce balanced graph partitioning results that would beat the quality of cuts generated in a recent paper. We are looking forward to seeing the improved results. 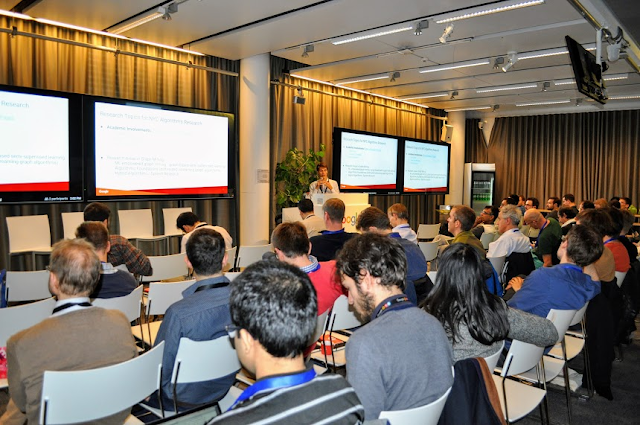 Privacy and Fairness: This session covered new topics concerning privacy-preserving algorithms, and fairness in machine learning and recommender systems. Both of these topics are among the main areas of concern in machine learning. For example, Sergei Vassilvitskii (Google New York) presented new algorithm to compute fair clustering and Elisa Celis (EPFL) discussed several aspects of Algorithmic fairness and Bias in Machine learning. Florin Ciocan (INSEAD) described algorithms for fair allocation and Graham Cormode (University of Warwick) presented algorithms for private release of marginal statistics. Sketching, Hashing, and Dynamic Algorithms: Finally the last session covered some recent results in the area of sketching, hashing and dynamic algorithms. Morteza Zadimoghaddam (Google New York) opened the session describing a new algorithm for dynamic consistent hashing. Then Robert Krauthgamer (Weizmann Institute of Science) presented some recent results on graph sketching and combinatorial optimization. Sayan Bhattacharya (University of Warwick) described the design of Dynamic Algorithms via Primal-Dual Method. And finally Pino Italiano (University of Rome Tor Vergata) presented new efficient algorithms for network analysis. Overall, it was a great day with many excellent talks and with many opportunities for discussing interesting problems. All the presentations, including videos, can be found on our workshop website, here.